We bet you didn’t think that shrugging your shoulders is one of the best ways to strengthen your shoulders. It is, though, according to Muscle & Fitness magazine, Men’s Fitness magazine, and Bodybuilding.com. OK, we’re being a bit deceptive. Just shrugging your shoulders while you’re just standing and not doing anything else might not make your shoulders stronger and broader. Nevertheless, it was more than surprising to learn that several fitness experts put exercises that include shrugging your shoulders at or near the top of their lists of best ways to build your shoulder muscles. 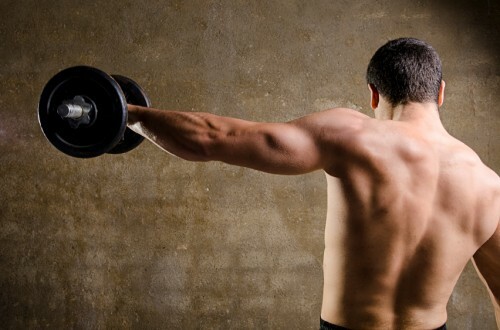 In the article, which is entitled “Get Bigger Shoulders With 5 Easy Moves,” Muscle & Fitness magazine recommends doing at least 20 shoulder shrugs three or four times during a workout. This means that you should be lifting lighter weights than you are used to exercising with. Shrugs, it says, work better with more repetitions and less weight. Done correctly the shrugs will strengthen your trapezius muscles as well as your upper back. The article recommends doing eight shoulder shrugs five times, resting 60 seconds between each of the five reps. The other dumbbell exercises that it recommends for your shoulders are the Raise Complex and the Seated Dumbbell Clean. The Bodybuilding.com article “How To Build Big Shoulders, Safely” emphasizes that you should shrug your shoulders straight up and down when you’re doing exercises it names simply “Shrugs.” “Don’t roll your shoulders,” the article reports. Otherwise, the technique it recommends is similar to the recommendation for Muscle & Fitness magazine’s Barbell Shrug, but it reports that you can use dumbbells as well as barbells. The Feet Elevated Pike Pushup: This exercise involves raising your rear end toward the ceiling while you’re in a pushup position until your body is vertical. Then, you should lower your body to the floor until your head is between your hands. The article recommends doing 12 pushups four times with 60 to 90 seconds of rest between each rep. The Wide-Grip Pull-up: Your hands should be “much wider than shoulder width” apart on the chin-up bar. Your palms should face forward. You should pull yourself up until your chin is over the bar five times. Do as many sets as possible.